Koalas sometimes are referred to incorrectly as “koala bears.” Koalas are not bears. 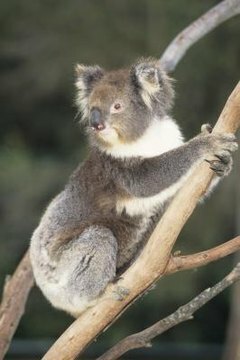 They belong to a group of pouched mammals, called “marsupials,” many of which, like the koala, are endemic to Australia. Its closest living relative is the wombat, but other koala relatives include kangaroos, wallabies and opossums. Wombats are large and sturdy, and look similar to giant guinea pigs. The common wombat, southern hairy-nosed wombat and the nearly extinct northern hairy-nosed wombat are the three different species found in Australia. Wombats suckle their young in their pouches. Babies then remain in the mother’s underground burrow for nearly two years. Kangaroos give birth to their young and suckle them on a teat inside their pouches. Baby kangaroos, called “joeys,” are tiny when they are born and remain in the pouch until they are 11 months old. The western and eastern grey kangaroos are endemic to Australia. Kangaroos get around by hopping on very large, powerful hind legs. Much smaller cousins of kangaroos, wallabies are found in Australia and its surrounding islands. Each species of wallaby is named after its habitat. These include the brush, shrub and rock wallabies. The hare wallaby is so named because of its rabbit-like appearance and behavior. The whiptail wallaby is so named for its long, slender tail. The red-necked wallaby is named for the red-hued fur on the back of its neck. Like their cousins, wallabies have powerful hind legs. They balance and support themselves with their tails. The only marsupial endemic to the United States, the Virginia opossum is a nocturnal omnivore that makes its home as comfortably in trees as it does on the ground. Opossums often hang from tree limbs by their tails. Opossums suckle their young in their pouches. After they leave their mother's pouch, they continue to nurse for a couple of months, so they stay close to her.